K9’s design doesn’t change much in the next 3000 years I guess. Eat recycled food. Its good for the environment, and okay for you. The Servo Droid is your friend. Embarrasingly, 769’s rookie robot used less than a square foot of plywood. On the positive side, the pipes never froze no matter how cold the movable goals were. Wait… Duct tape and zip ties CAN’T fix everything? That’s not what they told me in Robot Building school! Sometimes, you just gotta slap an RSL light and some bumpers onto a UFO from somebody’s backyard and call it a robot. I gotta say, that is some BLUE hair! Roomba’s first prototype needed a lot of refinement. NEVER let robot students build furniture. This is their attempt at a coffee table. We spent four weeks trying to make the robot drive, a week finding a strong enough coat hanger, a week building a crate, only to watch the BEAST walk away with all of it… never again. His first attempt at a teleportation machine only managed to knock him over when he tried to use it. Here we see a hint for the 2020 game, Air Duct Adventure. A young Mark Leon once time-traveled to the future. 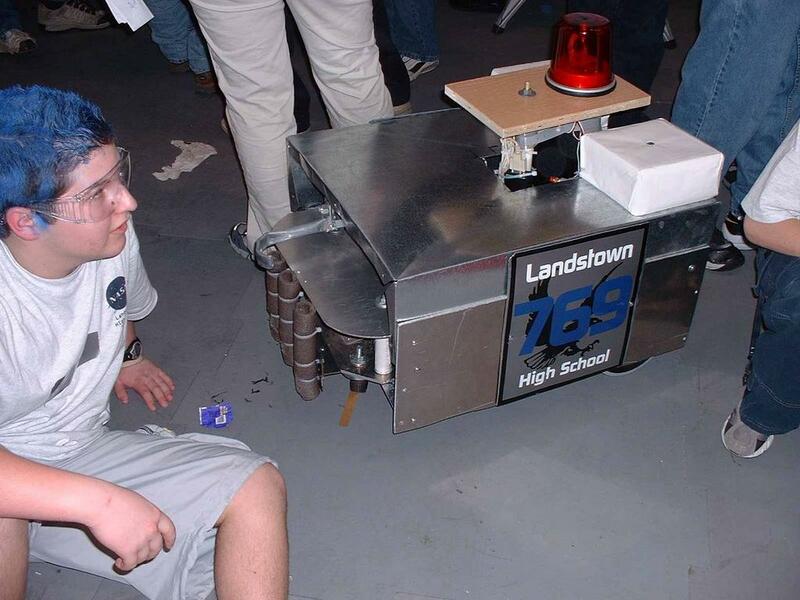 Here, he’s seen trying to blend in at an FRC event. Hey, you didn’t spot him either! Team 769’s attempt at a world map done FRC style: the Landstown High robot represents a land mass, and the person’s blue hair represents water. Can you imagine the G20’s this thing would generate? Hey, at least our robot can dye someone’s hair blue. That’s gotta be something, right?